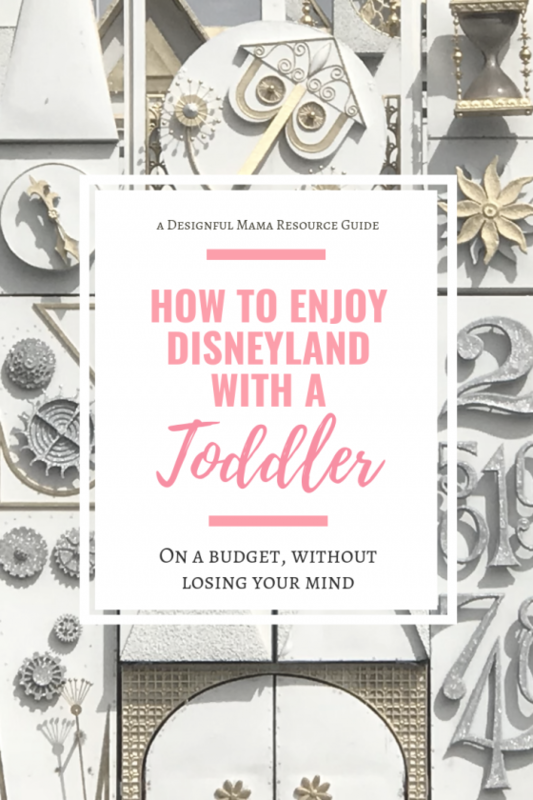 Considering or planning a Disneyland trip with your toddler? If you’re a fan of the House of Mouse, this can be an amazing experience to share with your kiddo. It doesn’t have to break the bank or demolish every last ounce of your sanity. As a long-time fan, I have always known that I wanted to start the tradition of visiting Disneyland with my son from a young age. I want it to hold the same sense of magic and wonder for him that it has for me, even after all these years. And for our recent trip, I really wanted to see and experience that magic through his eyes. Since going to Target with a toddler can be a challenge some days, we really thought out the trip well to try to make the most out of our time there. If this sounds like something you can relate to, then you may find these tips and tricks to be lifesavers! 1. Plan to spend 3 days at the park. We used a 4 day park hopper and really noticed we were good after 3. The morning of the 4th day, we hit a couple of favorites, shopped for souvenirs, found as many photo-op spots as we could, and hopped on the monorail for one more grand tour before our flight home. But the core of our visit was made up of 3 full days, which was just right. We chose to get park hoppers to keep our days flexible, knowing we wanted to see Cars land in daylight and after dark, but didn’t necessarily want to spend an entire day there to the exclusion of Disneyland. Disney’s California Adventure (DCA) does not have many toddler friendly attractions outside of Cars Land, but it’s worth strolling around the park and taking in the sights, sounds and smells! There is a Disney Jr. Dance party as well as several character appearances and small parades toddlers will love. 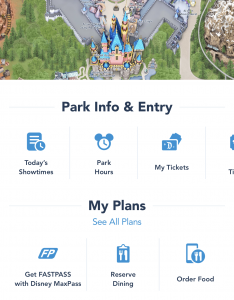 Check the times on the Disneyland app to know your options. Disneyland itself has a lot more that toddlers can do, and my thought is that it helps to group your itinerary by “land”. If you aren’t already so familiar with the park that you could sketch a map (and even if you are), it helps to get your hands onto a good map of the attractions and see what rides your child is tall enough for, before you go. Our little one just barely made the 35” cutoff for the roller coaster inside toon town, and thank God he did, because it’s now his all time favorite thing ever. And, if you need a place to start your planning, check out my resource post to find some of my favorite sites to visit before you go. The MaxPass feature is great for optimizing ride wait times, but for the toddler mom, it’s especially great for photos! Disney’s MaxPass allows you unlimited access to photos that are taken of you and your family during your visit, and there is no limit to how many photos you can have taken! Even if you get one good gem for next year’s Christmas card, it’s worth the extra few dollars a day per person. You may want to get in some time in the park before stopping to take photos, and do photos in the later morning hours or afternoon when photo spots are less crowded. 3. Stay at a Good Neighbor hotel within walking distance. Depending on your family’s needs, walking distance may be across the street or a few blocks away. But it’s great to be able to head over in the morning and walk back during the afternoon for naps. And of course, at the end of a long day, a short walk to the hotel without waiting for a shuttle helps calm tired feet and overstimulated nerves. We stayed at the Fairfield Inn Anaheim Resort on our recent trip and enjoyed a park view. We could watch the fireworks from our balcony, and then immediately head inside to bed. On our upcoming trip, we will be at the Courtyard by Marriott Theme Park Entrance, which includes bunk beds for the kiddos but will not have a park view. Since we won’t be visiting on a fireworks day, this was non-issue for us this time. If you’re a Costco member, you can save a ton on good neighbor packages that include park tickets, and you can compare those prices to the property hotels to see whether you can fit one of Disney’s hotels into the budget. The Grand Californian is the best for proximity, followed by the Disneyland Hotel. Good neighbor hotels across the street are equally good for proximity for a lot less money, so definitely check them out. But the hotels have limited numbers of rooms they will sell through Costco. If you’re a AAA/ CSAA member, you can also check these hotels for direct booking prices too. If you book your hotel direct, you can buy tickets either through the hotel, through Disney, or another reputable source. Definitely don’t buy tickets from someone you don’t know or a business you don’t already trust. There are too many scammers out there! Plan to eat breakfast and dinner outside the park. If it’s in the budget, it’s wonderful to include a character dining experience at Goofy’s Kitchen – for breakfast or dinner (Disneyland Hotel), Storyteller Cafe breakfast or brunch (Grand Californian Hotel), breakfast at the Plaza Inn on Main Street, or Donald Duck’s Seaside Breakfast at the PCH Grill (Paradise Pier Hotel). Make sure to book in advance (up to 60 days). Lunch is often easiest to do inside the park, and several places now have mobile ordering available through the Disneyland app – order and head over to pick it up! For other meals, if you’re staying on Harbor there are a number of food choices very near the park. Panera and McDonalds offer ways to take a meal to go while you walk (or sit for a moment and watch the crowds speed-walk by on their way to the park). Be aware that Panera does not permit strollers inside. Other dinner options across the street on Harbor include Mimi’s and Tony Roma’s. Work backwards from bedtime and decide what time to leave the park. For a 7:30 bedtime, you’ll want to be in the hotel by 6:30, which means you’ll need to exit the park around 4:30-4:45 to walk to dinner and allow time to sit as a family and eat – before meltdowns and hangry bickering threaten to turn the park from the happiest into the crappiest place on earth for your family. If your kiddo takes late afternoon/ early evening naps and powers though to late bedtimes, this could be the dinner break before closing down the park. We are early risers and enjoy the less crowded early mornings to make the most of our time at the park. For others, waking up early and rushing out the door might be a terrible way to start your day. Do what works best for your family! Whether you make the trek to the Happiest Place on Earth via air or car, a stroller is an essential when visiting the park with the under 5 crowd. Not only does it hold everything, but it also becomes its very own crash pad for when the kiddo gets “Disneyland wasted” and needs to pass out. Keep in mind that strollers cannot board the train inside the park and must be collapsed to board the monorail. There are stroller parking areas outside of most attractions, so you can park the stroller to get in line. In our experience, even a fully-loaded stroller with diaper bag and souvenirs (minus a small crossbody bag with valuables that stays with me) can be comfortably left for stretches of time while the family is off riding and exploring. Disney has stroller attendants who constantly shuffle the strollers in their designated parking areas to make room for new strollers to be parked. When you return for your stroller, expect it to have moved around a bit. And though our experience has been great, it’s always the best policy to never leave anything on your stroller that you would be terribly upset to lose. We also brought our ErgoBaby carrier, and it helped when our toddler needed the physical contact of being carried rather than sitting in the stroller. For an overstimulated and overtired toddler, this may be the trick that actually gets them to fall asleep or decompress. 6. Bring an abundance of snacks. When we visited, we opted to fly, and the snacks got their very own small suitcase! We brought juice boxes, pretzels, fruit snacks, raisins, goldfish, Belvita breakfast bars, and a gallon sized ziploc bag full of quart, snack and sandwich bags. Each night as part of prepping for the next morning, we portioned out the bulk snacks in the sandwich bags and created a snack pack out of the quart sized bags. Voila! Tuck the snack pack into the diaper bag / backpack along with juice boxes (we packed 3 per child per day to encourage hydration) and you have an instant mobile snack shack! This will help soothe fussy nerves brought on by dehydration and hunger, and can also help incentivize patient behavior (if you believe in the occasional bribe) when lines are long and boring. Since we flew, we couldn’t pack fresh fruits, veggies or milk, so we bought those at the park, and we bought water at the hotel gift shop, which costs far less than it does in the park. For our next visit, we’ll be driving, and bringing a cooler full of more nutritious options: apples to slice, baby carrots, hard boiled eggs, string cheese, cuties and yogurt. We will include a small insulated lunch bag to stow them in on the stroller. Note: always be cautious when giving hard foods such as apples and carrots to a toddler as they can represent a choking hazard. Also, raisins are particularly attractive nostril stuffers for the under 3 group and are hard to get out! Only you can decide whether your child is ready for these foods. Save yourself an emergency room visit by selecting the foods your child can safely enjoy. Plan a hotel fun pack and include comfort items. Consider bringing some new toys (we presented our kiddo with a few new Cars toys, a coloring book, some legos and a puzzle – each introduced on a different night). These can help with the nightly wind-down to encourage quiet play with one parent while the other showers and preps for the next day. We also recommend packing a few beloved books, a handful of small stuffed animals and some favorite blankets. These help bring the comforts of home to your temporary living space to help establish familiar routines. A travel bottle of bubble bath and a few small bath toys make the nightly routine comforting and familiar. A nightlight and white noise machine from home will help the dark hotel room feel more nurturing too. Toddler clothing doesn’t take up much space at all, so you can pack their clothing alongside yours and devote the kiddo’s suitcase to the comforts of home. Baby carrier, blankets, potty step, pull-ups, toys and toiletries are all in one place when you arrive. And likewise, if you’re at all like me and prefer to coordinate outfits for family photos, pack 2 toddler outfits for each of your adult outfits and put them together in the suitcase. That way you can just pull out the daily bundle that includes your outfit, the toddler’s outfit to wear and the toddler’s backup outfit to pop in the diaper bag before you go to bed each night. Take everything out of the stroller, wipe it down, re-pack the diaper bag including spare outfit and snacks (leave the refrigerated ones and beverages in the hotel fridge until morning), stow a blanket or two in the stroller cargo area, and set out the clothing and shoes for the next day. Put the camera and phone on their chargers and if you are bringing a power pack, charge that as well. The easier you can make your morning, the more time you get to spend in the park when it’s the least busy. It’s great to create an attraction agenda in advance. Know what attractions and events you really want to include, especially if they are “Must do’s.” But as much as possible, try to keep the musts to a minimum. There are a lot of things to see and experience, and it’s exciting to see them and experience them through the eyes of a child. But what is a can’t-live-without for you may not be interesting or exciting to your child. Take your cues from them. What are they pointing to? 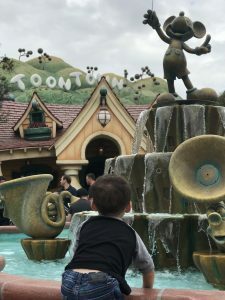 If you really want to get to Autopia but your toddler wants to ride the roller coaster in Toon town again, give them a second go – and promise to return later if they are having trouble transitioning away. The fireworks and evening shows are spectacular, but the fact that they happen after dark means that toddlers are least likely to appreciate them and most likely to fall asleep or enter a DEFCON 5 level meltdown instead. Don’t force it. This trip is about making memories, and the best ones will be those that take advantage of your child’s interests and energy level. Watch for beloved character appearances on the Disneyland app and let your child discover the character on his or her own. Our son was so excited to see Goofy and Pluto, that he ran up and hugged them, and then waited in line to do it again. Take pictures, and let the child review them in the evening and in the days and weeks ahead. You may be surprised at what they remember and what details they love to re-tell. Include rest in your to-do list. Be flexible enough to drop an activity that your kiddo isn’t into – and be very aware of the need for frequent breaks to have a snack or a meal and just be still. While Disneyland is reducing their seating areas in preparation for the added crowds they anticipate with the opening of Star Wars Land, there are still a couple of good spots to sit and rest. Toon Town has 2 water fountains that are a great place to take a break from stimulation and activity and just hang out. And, they happen to be a great spot to snap a few photos. Fantasyland has a terrace near Small World that offers a quiet place to sit (and is the best place to view a parade from, in my opinion!). There are several boat rides in the park that also offer fun that isn’t too stimulating. Small World, of course, has a lot to see and hear, but is great for toddlers. 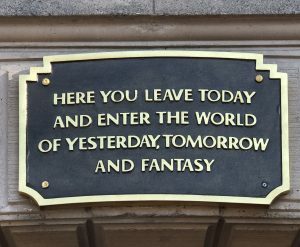 Fantasyland has the Storyland boat ride, Tomorrowland has the Finding Nemo submarine ride, Frontierland has the Jungle Cruise, New Orleans Square has Pirates (this can be a little bit scary due to the dark and loud noises, so use your best judgment), and there are riverboat rides in Tomorrowland as well. Train rides are also a good way to decompress – the train that circles the park has stops at the main entrance, New Orleans square, toon town/ small world, and Tomorrowland near Autopia. There is a monorail entrance in Tomorrowland, and the Casey Jr. train in fantasyland. All of these offer lower-stimulation activity and are a fun way to see the park. Rest breaks might also mean leaving the park and strolling through the Downtown Disney district or one of the garden-lined walkways between the hotels on the property. The bottom line is this: you know what works for you and for your child. Be aware of their (and your!) needs for rest and hydration, so that you can truly enjoy the magic Disneyland has to offer.